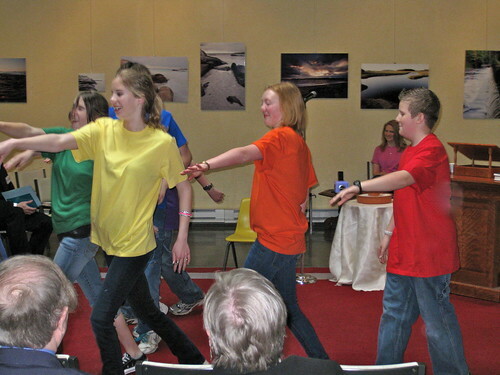 Members of the Northshore UU Church Youth Group presented a service of their own design on Sunday. Titled “Acceptance: It’s Who U(U) Are!”, the service focused on opposing bullying, hatred, racism, and stereotypes, and featured dancing, movies, readings, stories. The youth service made for a special morning, and the young men and women who participated deserve a lot of credit for their hard work. Thanks also to Ashley Benner, our interim director of religious education. The service was followed by our annual meeting, a sitdown lunch, and the People-to-People Auction.